Ships tomorrow if you order in the next 24 hours 49 minutes. If you suffer from gluten or casein intolerance, you understand how difficult it can be to digest them. Food allergies typically damage the villi in your small intestine, making it difficult to absorb nutrients from foods, and also affecting your body's ability to produce enzymes that help digest gluten and casein. As a result, nutrient deficiencies, malabsorption, and other digestive disorders can occur. 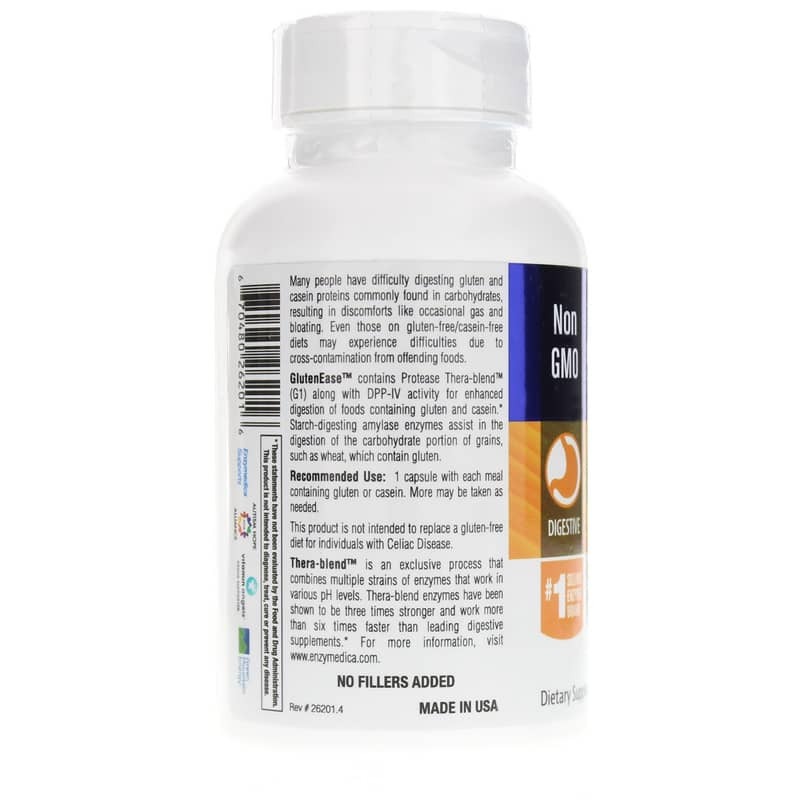 GlutenEase with DPP-IV Activity from Enzymedica is formulated with a unique Thera-blend of enzymes that support the optimal digestion of casein and gluten in people with intolerances. While many people choose to simply remove gluten and casein from their daily diets, this can be difficult at times and also does not present a long-term solution. 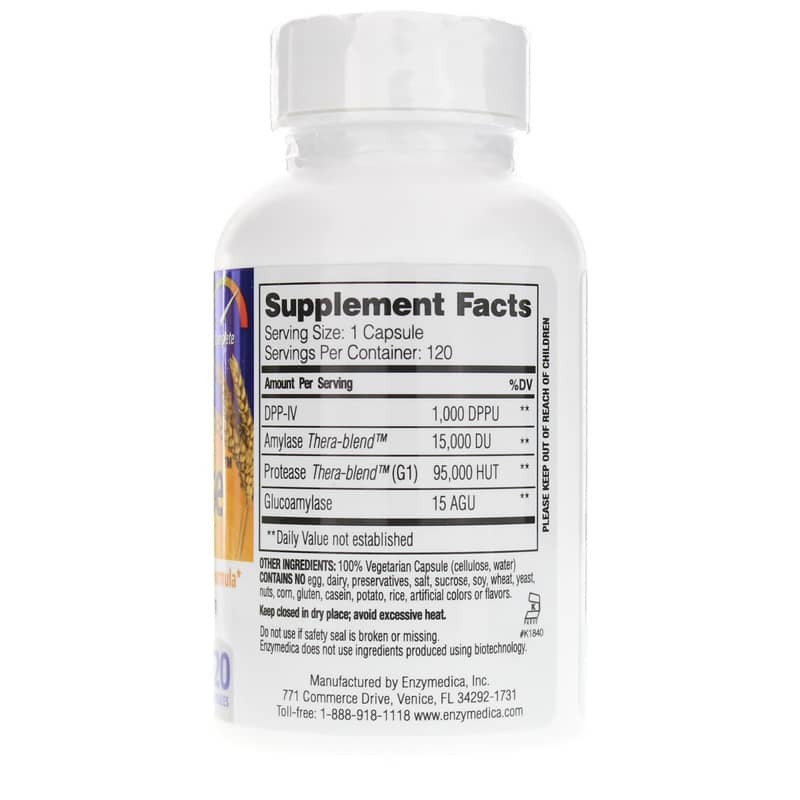 Enzymedica's GlutenEase with DPP-IV Activity promotes digestion of accidentally ingested casein and gluten, and may help broaden the food groups available to certain people. Give your body the help it needs to digest gluten and casein. 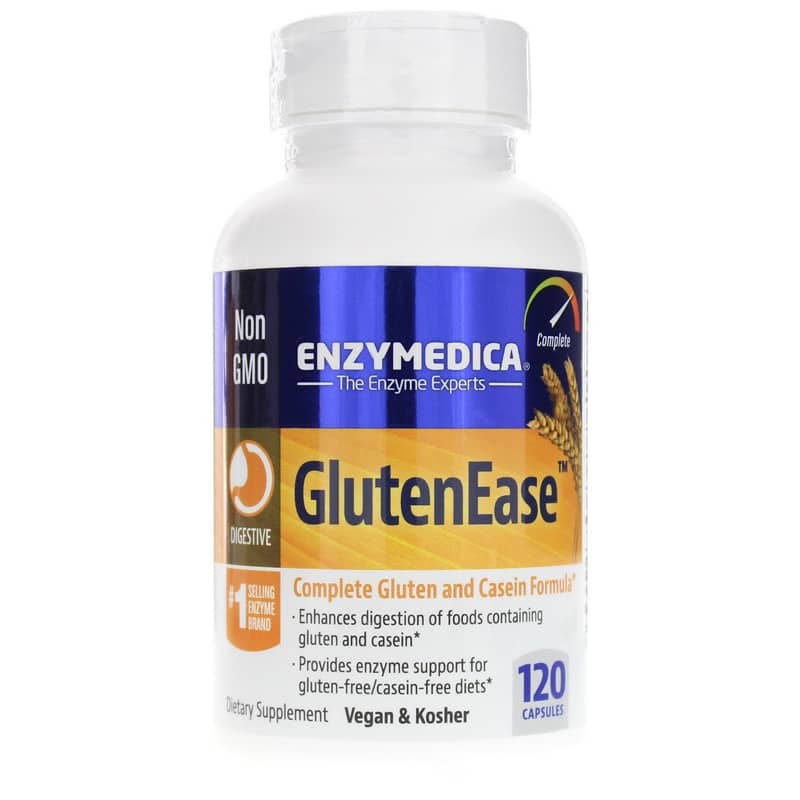 GlutenEase with DPP-IV Activity from Enzymedica improves your digestion while enhancing your overall health and wellness. Give it a try today! Contains NO: dairy, preservatives, salt, sucrose, soy, wheat, yeast, nuts, corn, gluten, casein, potato, rice, artificial colors or flavors. Non-GMO, Vegan & Kosher. Adults: 1 capsule with each meal containing gluten or casein. More may be taken as needed. This product is not intended to replace a gluten-free diet for individuals with Celiac Disease. If you are pregnant or nursing, please consult your healthcare professional before using this product. Keep out of the reach of children. GlutenEase w/DPP-IV Activity is a great product. I tried other gluten-related products and this works the best for me. It heavily reduces side effects after eating many food items that I am sensitive to (which are many!). Thr BEST Gluten digestive aid! I have been taking GlutenEase DPP-IV for years and wouldn't be without it! I can eat almost normally! When I eat gluten, which I try to stay away from, GlutenEase greatly helps with the discomfort that may follow as long as I take 2 before I eat the gluten. I know this is not a cure but it is helpful when needed.